Mary's Peak - Monument to the Flood! Mary's Peak near Philomath, Oregon. The hump just to the right of the peak is actually a sandstone turbidity deposit, (high-speed underwater mudflow), part of the Western Oregon Tyee formation - at the 4,000 ft level! What is a water pushed flow doing up it this altitude? In the drawing on the left, notice the fault line (center vertical) that indicates more of the Tyee was higher on the formation but was eroded. This means our Peak here was under moving water for a period. The Coast Range in Oregon is thought to be a result of the Pacific Plate being rapidly pushed under American Continental Plate, which bulged this area upwards north and south. The Tyee shows up atop many of the mountains near and south of Marys, substantially thicker in places and tilting to the south. What is such a massive catastrophic formation doing up there? Above is a Geology profile map of Mary's Peak showing the location of a slice of the Tyee. (2) Located near center of the entire formation (1), is the Peak, the tallest mountain in the Oregon Coast Range. Notice the center fault line, spiting the mountain in two, another sign of catastrophe and maybe a message in the rocks. Note the crest of the Peak in the cross-section, what happened to the rest of the Tyee? It was all once far higher, while still loose gravels and sand and must have washed away, most likely into the Pacific Ocean which has been proven the case, where its found again reaching a thickness over 10,000 feet! "Early in the history of the geosyncline, lavas and breccia erupted from numerous centers onto the floor of the rapidly subsiding trough. These volcanic rocks intertongued with, and in places were buried by, silts and impure sands that probably were derived from the southern and eastern margins of the geosyncline. Very coarse clastic debris, including cobbles and boulders, was laid down contemporaneously with the sands and silts in the southern part of the geosyncline, reflecting uplift and erosion of a rugged pre-Tertiary terrane in the present Klamath Mountains area. The presence of tuffaceous material and detrital grains of andesite in many of the impure sandstone beds of the Umpqua Formation suggests that part of the detritus was derived from volcanic fields that lay east of the geosyncline. The current structures, the high percentage of unstable rock fragments in the Umpqua indicate rapid deposition, probably by turbidity currents (underwater mud flows) that flowed generally northward and westward, In middle Eocene time major uplift and erosion in the Klamath pre-Tertiary terrane south of the geosyncline and contemporaneous volcanic activity east of the geosyncline supplied great quantities of arkosic, lithic, and volcanic debris, perhaps triggered by earthquake shocks that accompanied active volcanism east of the geosyncline or by the failure of water-saturated, metastable sediments under gravity load, moved large masses of this mixed sand, silt, and clay basinward. These mass movements of clastic (volcanic ash & superheated water-mine) materials northward into the deeper part of the geosyncline are believed to have been transformed into turbidity currents that flowed along the axial part of the trough at least as far north as latitude 45°. The Oregon Coast Range was fairly continuous north and south for a short period and then was washed out, leaving what we see today. The Flood was a year in duration; there was the Genesis 7:11 explosion, the rain and underground cavern brake-up, the overflowing of every high hill by 20 feet (Genesis 7:20), then the water runoff for 150 days (Genesis 8:3). All air breathing life on earth was destroyed, only those inside the Ark were saved. Left were the billions of fossils we find today (they calculate in a single find at 800 billion in the Karoo formation, South Africa) many, many more graveyards exist world-wide buried in the sediments (as above the Great Unconformity of the Grand Canyon,) an event horizon of earth history in the rocks. See The Question of Fossils - Genesis Alive! and Grand Canyon Event Horizon - Genesis Alive! Also left were fossil fuel deposits, (as Dr. Park Snavely mentions above). See The Ice Age - Genesis Alive! Those deposits became coal and oil for man to use in the new world, a much less habitual and cooler place than before, and likely far less productive food wise. These resources would be needed for man to survive and are scattered across every continent for mankind's use. (4) the eruptions of new volcanoes that make up the Cascades along with the multiple flows of the Columbia basalts, these over one mile deep covering over 80,000 square miles! Evolutionists claim these flows are old, but that's not true, they show no signs of weather/erosion between each layer. Dates for the Crater (Mt. Mazama) Lake eruption are given as young <8K years. The author found a young pine stump while excavating near there, growing on water deposited breccias at 5,000 ft but beneath the above eruption's ash fall, suggesting a short time gap between the end of the Flood and the eruption. This suggests a lot of instability was going on in the zone after the flood waters receded. In truth, average erosion would wear every mountain in the world flat in only 18 million years, (see age section The Question of Time - Genesis Alive! ) placing in serious question long-ages geologically. A Rino was found encased in one of the upper Columbia Flows, caught in the disaster. The atmosphere of the entire world would have collapsed as a result of this Lava Flow calamity alone. We also know that these events were going on world-wide due to the many North/South magnetic pole reversals seen among the Columbia flow sequences at Steen's Mtn., (3) where reversals have been detected locked in the flows suggesting n/s polar change intervals of hours! These catastrophic events were also going on all across the Pacific rim, known as the Ring of Fire, and not only there, but the entire planet was being unstitched like a baseball! 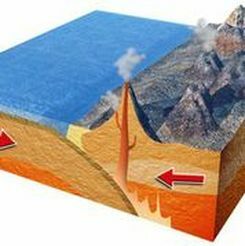 Mountain ranges all over the planet like the Himalayas were being pushed up from their source - a sea floor! These events make the St. Helen's eruption look like a sandbox play-day. Similar catastrophes were occurring all over the Earth at the same time. Nothing living on the planet could have survived this period. We know mammals lived in Oregon prehistorically, sedimentary eddies near Mitchell and Salem Oregon (4) contain large fossil beds that include mastadons, mammoths, elephants, camels, tigers, bison and Plesiosaur, swimming for their life! (5) Remnant topography from the Flood is found everywhere across Oregon, seen in the many buttes where square miles surrounding material was removed by water. In any case, God declared He would destroy the world and He meant business! I wonder if there were sinful cities located on the Pacific Plate that submerged and were recycled into the Columbia Lava sheet! In conclusion, the story of the Tyee, a relatively unknown formation now mostly covered with forrests, sounds out loud the Flood Story written in the rocks of Oregon, and stands as a testament atop Western Oregon's most prominent landmark. I believe this was for a reason. Now you know. Marys Peak - the Last Mountain Standing! The Creator is interested in your life and sees you reading this chapter right now!, reach out to Him and receive a passport to enter His eternal Arc of care and protection, just like Noah and his family did, but now through Jesus Christ! Jesus said: "Just as in the days of Noah, so shall the coming of the Son of Man be". Will you be ready?